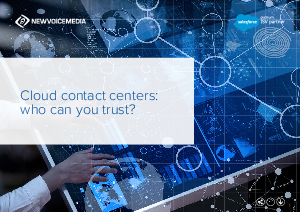 Home > New Voice Media > Cloud Contact Centers: Who Can You Trust? Are you thinking about moving your contact center to the cloud but have concerns about performance, availability and security? Download our whitepaper to learn how to get the reliability you need from your cloud contact center software.